The Nortel Meridian 1 was first introduced in 1976, one of the industry’s first fully digital PBXs. More than 43 Million Nortel Meridians have been installed worldwide. 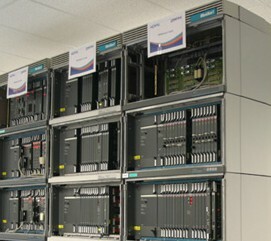 Comtek repairs the complete range of Nortel Meridian products. All of our Nortel Telecoms repair team members are top-level former Nortel employees. Comtek’s knowledge of the installation, commissioning, maintenance and repair of Nortel Meridian products is unsurpassed in the repair industry. We are familiar with the complete range of Meridian products and have test rigs for all the Nortel Meridian variants. Comtek’s Nortel Meridian repair service will keep your Meridian systems running indefinitely, saving you money, and maximising the return on your investment. Powerful PBX with a small footprint for a networked branch office. Meridian Option 11 Mini has all the features of Meridian Option 11, in a smaller-chassis. Stand alone or networked, delivering advanced applications including e-Mobility, unified messaging, ISDN networking, and call-center capabilities. Meridian Option 61 C is a carrier-grade platform supporting voice, VOIP, Wireless IP Gateways, Unified Messaging, Call Center applications, ISDN, Q.Sig, VPN, PC-based System Management, remote solutions, and multimedia communications. Meridian 1 Option 81C features, an internal 622Mbps OC-12 switching fabric, and support for voice, digital and IP phones, traditional and unified messaging, IP gateways, ISDN Q.Sig and VPN access, call centers, PC-based call management, Wireless communications, intelligent remote solutions and multimedia support. Carrier-grade performance and reliability, based on Nortel Networks DMS-100-based architecture. The Meridian SL-1 was the first practical all-digital telephone switch for the smaller PBX market. It was first introduced in 1975 by Northern Telecom, later to become Nortel. The Meridian SL-1 design was later expanded to provide products at all sizes, including the DMS series high-end machine.